After two years, Saban Brands’ five-hour children’s programming block will say goodbye to Saturday mornings on The CW this fall. Vortexx on The CW will have its final run on September 27, thereafter being replaced with One Magnificent Morning, a new teen-targeted block featuring an assortment of live-action educational and informational (E/I) shows distributed by CBS Television Distribution. Saban had acquired the five-hour Saturday block and 4Kids’ television broadcast management crew in June 2012, which were components in a larger sale by 4Kids while it was reorganizing in Chapter 11 bankruptcy protection. As a part of the acquisition, Saban and Konami had inked a deal to broadcast Yu-Gi-Oh! on The CW through at least the summer 2016 season. Their agreement allows for the termination of their relationship in the event that Saban no longer has the rights to program the block for any reason. The Yu-Gi-Oh! License does not restrict the Yu-Gi-Oh! anime to any specific TV network and leaves the door open for Konami to either license the series’ TV broadcast rights to another broadcast or cable network, or, if unsuccessful in such an endeavor, to syndicate the series. There’s no word yet on which network new episodes of Yu-Gi-Oh! ZEXAL will premiere come fall 2014. One possibility is Nicktoons, where ZEXAL made its debut in April 2013 and where the series currently airs every Sunday. There’s also no word on what will happen to Vortexx’s programming on Kabillion, or whether the Vortexx brand will still be in use after this summer. Reps from 4K Media (Konami) and Saban Brands did not reply to inquiries at the time of this writing. Saban announced today that it is partnering with independent video-on-demand network Kabillion to create a dedicated channel for Vortexx’s programming. The new VOD channel will debut in June with Sonic X and Power Rangers: Lost Galaxy, with Dragon Ball Z Kai joining the line-up in July. Kabillion’s library of shows include Bobby’s World, Code Lyoko, and Mix Master and is available on-demand on a variety of cable services, including Comcast, Time Warner, Charter, and Blue Ridge. It is also available online at Kabillion.com and on YouTube on KabillionChannel and Cartoonium. Vortexx’s current programming, which includes the classic Yu-Gi-Oh! and Yu-Gi-Oh! Zexal series, can be seen every Saturday morning on The CW and on MyVortexx.com. After months of stagnation, anime video portal Toonzaki.com has finally updated its Yu-Gi-Oh! 5D’s and Yu-Gi-Oh! Zexal offerings to include the latest episodes. It’s about time! Uploads of new subbed episodes of Yu-Gi-Oh! 5D’s and dubbed and subbed episodes of Yu-Gi-Oh! Zexal had resumed on Hulu back in January, but Toonzaki’s feeds had curiously stopped refreshing to display the latest videos until now. Toonzaki has also patched up its many missing images and broken links, and has picked up several more shows from Crunchyroll, including Fate/Zero, Polar Bear Cafe, Space Brothers, and Sword Art Online. How many new titles can you spot? With the launch of the Japanese-run anime video portal Daisuki.net right around the corner, the Toonzaki crew has picked a good time to polish their website and make sure it remains in the running to continually draw the attention of casual anime seekers. Over on MyVortexx.com, the official website of Saban’s Saturday morning Vortexx block, links to the dedicated pages for Classic Yu-Gi-Oh! and Yu-Gi-Oh! Zexal were finally set up in late March. When MyVortexx was revamped back in mid-February, both shows were missing from the website’s “Shows” page. If you had noted my not-so-subtle hint and snooped around however, you would have discovered that pages for both shows had actually already been set up at the time MyVortexx’s new look was unveiled. The other main MyVortexx pages had simply not linked to them, for whatever reason. So what’s new? Since then, the pages have seen the addition of the shows’ full episodes — most notably the subbed Japanese Yu-Gi-Oh! Zexal videos. While this might not seem like a big deal to longtime Yu-Gi-Oh! fans, by deciding to post these videos, Saban has taken a momentous step forward. Younger Vortexx viewers, or other Vortexx fans who are browsing the website and who might not be as well-versed about what sorts of Yu-Gi-Oh! media are available out there, now have a chance to stumble upon the Japanese episodes and enlighten themselves with a slew of original uncut videos. Although official Japanese Yu-Gi-Oh! episodes have been around for a few years now, they had never previously been included side-by-side with other Saturday morning shows on Toonzai and 4Kids.TV’s websites. Unfortunately, MyVortexx’s redesign suffers from a usability issue similar to that which plagued 4Kids.TV/Toonzai when that website was revamped in September 2010: its design is simply not suitable for linking to and posting full episodes. The organization of the videos is an absolute mess. Episodes aren’t numbered and aren’t listed in their proper orders, and dubbed and subbed episodes are all jumbled together. 4KidsTV/Toonzai eventually improved its layout to better accommodate its video listings. Will MyVortexx do the same? Speaking of Toonzai, the Facebook page of the former Saturday morning anime block managed by 4Kids was finally shuttered on March 22 — a little over seven months after its final broadcast. The last two wall posts were made on March 11 and directed fans to the official Yu-Gi-Oh! Facebook page and Toonzaki’s Facebook page. 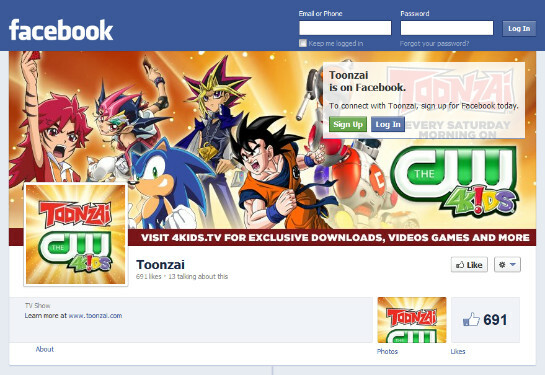 Toonzai’s Facebook page was never very popular or heavily promoted. During its final days, it had a mere 691 Likes. Nevertheless, it was a window to an increasingly disregarded Saturday morning animation haven that many cherished, and it and the lifestyle the block embodied will be missed. Let’s end on a happier note: Yu-Gi-Oh! Zexal will be premiering on Nicktoons this Friday, April 12 at 9:00 pm EDT! The newest series in the Yu-Gi-Oh! franchise joins Classic Yu-Gi-Oh!, which premiered on the Viacom-owned cable network on March 11 and now airs seven days a week. This weekend is unusually eventful for Yu-Gi-Oh! Zexal fans in both Japan and the United States. On Sunday, October 7, fans in Japan will be treated to Yu-Gi-Oh! Zexal II (the “II” is pronounced “second”), a sequel to the first Zexal series, which ended on September 24 after a 73-episode run. Zexal II will continue the story of Yuma Tsukumo, Astral, and their friends following the conclusion of the World Duel Carnival tournament. The second series will air every Sunday at 5:30 pm on TV Tokyo and most of its sister stations. Since the story is merely continuing without any significant changes, why did the first Zexal series need to “end,” necessitating the creation of Zexal II? That hasn’t happened in any of the previous Yu-Gi-Oh! series before (unless you include the 1998 Yu-Gi-Oh! series by Toei). Maybe fans who follow the series can share their insights. The news is far less positive in the U.S., where Saban is dropping the 8:30 airing of Yu-Gi-Oh! Zexal from its Saturday morning Vortexx lineup. The change begins today, October 6, and leaves fans with two broadcasts of Yu-Gi-Oh! on the block. The change comes just six weeks after Vortexx premiered on The CW. There has been no official comment from Saban or Konami regarding Zexal’s removal. Vortexx hits the airwaves on Saturday, August 25. As usual, check your local listings for the exact dates and times. And if you haven’t already done so, check out Vortexx on the web at MyVortexx.com, Facebook, and Twitter! As previously discussed, the number of Yu-Gi-Oh! broadcasts has been trimmed from four episodes on Toonzai, to just three on Vortexx. One of the Yu-Gi-Oh! Zexal broadcasts will feature a new episode. You won’t really need to wait until August 25 to catch a new Zexal episode though! On August 18 — the final broadcast of The CW4Kids Toonzai — a new episode will air at 11:00, wrapping up a three-and-a-half hour Zexal marathon. The last episode of Yu-Gi-Oh! Classic (“The Final Duel, Part 4”) will then follow at 11:30. Way to go, Toonzai! That’s how you sign off with a bang! Earlier this month, Saban Brands revealed that it had acquired The Playforge, the makers of the popular mobile game Zombie Farm. The acquisition opens The Playforge up to a wealth of new licensing and merchandising opportunities, and also provides Saban with the talent and resources to expand solidly into the digital realm with the development of new mobile and online platforms. Could we see social and mobile gaming playing a significant part in Saban’s Vortexx brand? On July 20, YuGiOh.com shut its doors and automatically redirected all traffic to the anime video portal Toonzaki.com. There’s been no official word on what led to this change. YuGiOh.com launched in January 2011 and was meant to serve as the international hub for all things Yu-Gi-Oh!, from the TCG, to the anime, to the merchandise. Earlier in mid-July, a Toonzaki rep noted in a comment on Facebook that Konami was now the owner of Toonzaki, having secured the brand as part of 4Kids and Konami’s $15 million deal.